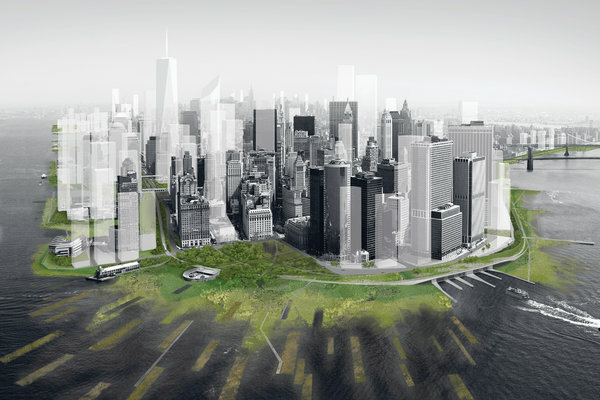 URBAN WETLANDS A rendering of Lower Manhattan that shows tidal marshes to absorb waves. Should New York Build Sea Gates? How can we better protect New York City from flooding? The water rose in Dumbo, Brooklyn, on Monday. Red Hook, Brooklyn, was hit hard last week by flooding from Hurricane Sandy. 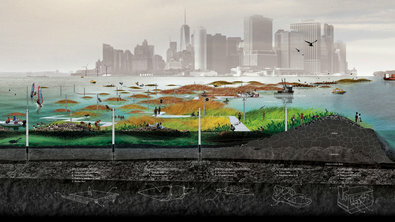 WATERWORLD A reef constructed from rock and shell piles to host oyster growth, as seen in a rendering for a proposal in Brooklyn. Such a structure could filter water and mitigate storm surge. 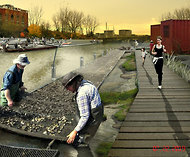 AQUACULTURE Oyster beds as depicted in a rendering for a proposal in Gowanus, Brooklyn. The shellfish could be cultivated by community groups and seeded on a planned reef, part of a water filtration and surge-mitigating system. A rendering of a storm barrier with a drawbridge on Arthur Kill, intended to protect Staten Island in a Category 3 hurricane. Staten Island was ravaged by Hurricane Sandy, as entire neighborhoods were flooded, a168-foot water tanker crashed onshore and city officials said that most of the fatalities in the city occurred there. It is arguably New York’s most exposed borough, surrounded not by peaceful rivers but by oceanic channels like the Arthur Kill and, of course, the Atlantic itself. A rescue from Dongan Hills, Staten Island, on Tuesday. A version of this article appeared in print on November 4, 2012, on page MB1 of the New York edition with the headline: Protecting the City, Before Next Time. A storm brewing in the South China Sea will hit Cambodia tomorrow, causing heavy downpours, wind and flooding in up to 13 provinces, the Ministry of Water Resources and Meteorology warned yesterday. Tropical Storm Gaemi was yesterday a low pressure system about 700 kilometres west of Danang, Vietnam, but will develop into a larger storm, also crossing parts of Laos and Thailand, over the next four days. Fishermen in Koh Kong, Kep, Kampot and Preah Sihanouk provinces have been told to postpone fishing over the weekend and stay on high alert. The storm is expected to cross Cambodia tomorrow and depart Monday. Nak Seng, a fishermen’s representative from Troy Koh commune in Kampot, said some fishermen would venture out despite expected waves of up to 2.5 metres. “We won’t go far from the shore, and we’ll come back when we see the storm,” he said. In his announcement, Minister of Water Resources and Meteorology Lem Kenhor said Gaemi would cause heavy rain, wind and floods in the higher-up provinces of Kampong Cham, Mondulkiri, Ratanakkiri, Kratie, Stung Treng, Oddar Meanchey and Preah Vihear; lower-lying Siem Reap and Kampong Thom as well as Koh Kong, Kep, Kampot and Preah Sihanouk. Meanwhile, more than 200 families in Banteay Meanchey’s O’Chrou district face emergency evacuation after Thai authorities in the border province of Sa Kaeo were forced to release water from an overfull dam on Monday. Soung Muon, O’Beichoan commune chief in Banteay Meanchey’s O’chrou district, said that water levels had increased by more than half a metre yesterday as authorities prepared to move villagers to higher ground. “It doesn’t rain here, but water is increasing a lot. We could assume that it flows from Thailand, and about 200 families might be evacuated soon. We are observing the sutation,” he said. The National Committee for Disaster Management will revisit the province tomorrow. Disputed figures surround the flood death toll in Banteay Meanchey province. But according to numbers obtained from other local authorities, including police and district governors, the deaths add up – with three people drowned in Poipet, three in Serei Sophoan, three in Ou’chrov dstrict, two in Phnom Srok distict and two in Mong Kulborei district for a total of 13 people. The most recent victim, an 18-year-old from Poipet, had been found dead on Saturday, Poipet governor Ngor Meng Chroun said. Thai authorities in the flood-prone border province of Sa Kaeo informed Banteay Meanchey authorities they might have to release a dam that is filling up after an extended wet period. “Thailand informed us, so we alerted our people in Ou’chrov district and Poipet town, because they are the two places that will be affected first,” National Committee for Disaster Management’s Keo Vy said. By yesterday afternoon, Ratanak was still not certain whether Thailand would release the water. Last Friday, the government announced a low-pressure system would develop until Thursday, leaving 18 provinces, as well as national routes 4, 5 and 6, at risk of flooding. “The low air pressure can cause rain almost nationwide, so people living in the areas, be careful and take precautions,” the Ministry of Water Resources and Meteorology advised. Meanwhile, the flooding in Banteay Meanchey that forced 5,000 families to be evacuated and inundated 41,000 hectares of paddy fields, is on the rise again after subsiding early last week. Happy one year anniversary in Cambodia to City of Water! While driving with a HD Hero 2 Go Pro – here. With my waterproof camera an Olympus StylusTough-8010 – here – which does well in bright sun but rather poorly in rainy, low-light environment, especially when combined with traffic movement. One afternoon, I did get some shots on foot near my house with my Nikon D7000 – but that involved several ponchos and plastic bags. This was a rare opportunity to shoot the flooding from inside a van. Cambodia’s Commerce Minister Cham Prasidh said foreign investors with production bases in Thailand ought to consider Cambodia for future expansion because of the Kingdom’s greater resistance to floods. Speaking at Phnom Penh Honda’s 20th anniversary yesterday, the Commerce minister said that while Cambodia faces floods each year, the floods did not seriously affect most factories and industries. “Flooding affects only rice fields along the Mekong River – not factories. We also forecast that this year, the floods will be bigger than the last year, and we are trying to curb any negative effects to the economy. Cambodia’s industry sector, which is mostly located away from flooded areas, should not be affected,” he said. Hiroshi Suzuki, CEO of Business Research Institute for Cambodia (BRIC) agreed that floods did not have a severe affect on Cambodia compared to neighbouring countries, stressing that infrastructure such as roads were little damaged, connections between Phnom Penh, Thailand and Vietnam were not seriously impaired and only the tourism sector in Seam Reap was seriously hampered. 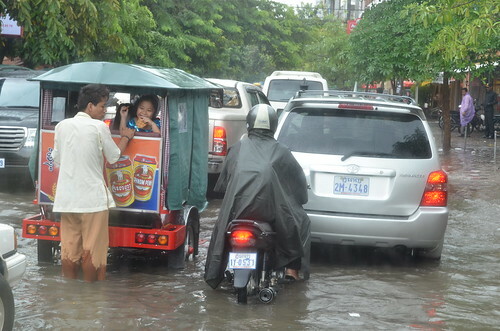 “Fortunately, Cambodia’s industry sector is very resilient to floods. Last year’s floods were the biggest in the 10 years. However, almost all factories were free from damage. Main industries such as the garment and textile sector weren’t susceptible to flooding,” Suzuki said. He said Japan’s Minebea had begun to expand their factory in Phnom Penh Special Economic Zone, as one example of an industry fairly impervious to flooding. Suzuki said the damage by flooding didn’t compel the Japanese companies operating in Thailand to plan relocations of factories immediately to the Kingdom. “In the middle term, some of those factories, especially the labour-intensive parts-manufacturing sector, would consider the transfer of a part of their operations to safer places such as Cambodia, as one of the measure of risk control,” he said. 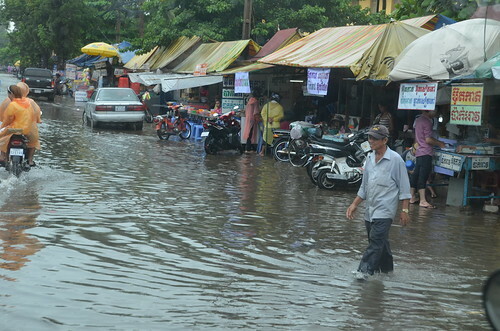 Chairman of the General Insurance Association of Cambodia (GIAC) Chhay Rattanak said last year’s floods had delayed some construction projects in Siem Reap province as well as the railway project in Banteay Meanchey province worth around $1 million. He hopes that this year the government will be well-prepared to deal with floods. Last year’s flooding in provinces along Mekong River damaged about 10 per cent of Cambodia’s total crop, compared to more than 60 per cent of crops that were damaged in Thailand. The Cambodian government spent about US$200 million for the rehabilitation of infrastructure hit by the floods last year. 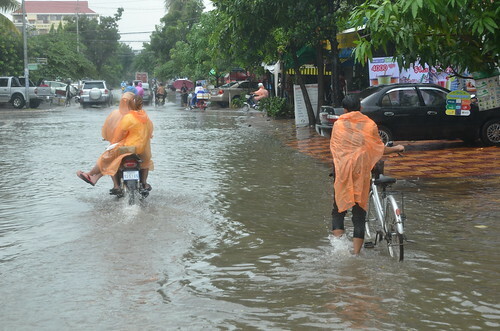 Cambodia has set aside $90 million for 2012 from the national budget against the possibility of flooding. Three people have drowned and more than 3,000 have been evacuated since flash flooding struck a trio of provinces late last week. Yesterday, the Cambodian Red Cross said it was mobilising aid and planned to have packages of rice, canned fish, noodles and other materials in the hands of 2,340 families, mostly in Banteay Meanchey, by this weekend. In the evacuated village of Ou’Bei Chean in Banteay Meanchey’s Ou’Chrov district, the body of a 34-year-old man was found yesterday morning. Commune chief Suong Suon said the man returned alone to his house while his family was being moved to safer ground. Ten of the 11 villages in his commune were flooded, Suong said, with 126 families forced to leave their homes. “Villagers are in need of food and the Cambodian Red Cross plans to distribute food and gifts for the 126 families on Thursday,” he said. A 59-year-old local drowned in Kampong Thom’s Kampong Svay district on Monday, and a 12-year-old girl drowned in Siem Reap late last week. Poipet governor Ngor Meng Chroun said officals were still busy moving hundreds from flooded areas, including Poipet City, to properly assess structural and environmental damage. The Asia Development Bank, which is leading Cambodia’s Flood Damage Emergency Reconstruction Project for last year’s devastating floods, said it wasn’t clear yet what rural road projects had been affected. 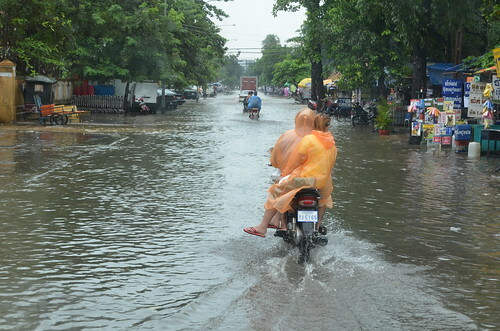 “When we considered the Stage Two projects, we selected them on their vulnerability, based on whether they were likely to be flooded again,” deputy director of ADB’s Cambodia mission Peter Brimble said. If the government did request help for newly damaged infrastructure the bank would look at money left over from existing projects, Brimble added. About 300 metres of national road under construction has been damaged in Ou’Chov district, authorities reported. Water has receded in some provinces threatened by flooding earlier this week, but rain is expected through to Sunday. WATERFRONT TORONTOAn illustration of the redeveloped Don Roadway shows how the area would look after the renaturalized Don River is directed through the Port Lands area. After dodging a proposal that would have turned the Port Lands into a carnival sideshow, development of the massive parcel of land is back on track. Waterfront Toronto and the city unveiled the latest vision for the Port Lands on Wednesday, almost a year after it was nearly critically derailed by councillor Doug Ford’s plan to build a Ferris wheel, monorail and megamall. “This is a silver purse we made out of the sow’s ear,” said Councillor Paula Fletcher, referring to Ford’s plan. The new $1.9 billion plan moves up the timeline for development, which is what the city asked for last September when councillors voted against Mayor Rob Ford’s bid to take over Waterfront Toronto, the city-provincial-federal agency tasked with developing the lakeshore area. The city also joined on as a partner. The original plan for the Port Lands was contingent on making the area floodproof in case of a massive storm that would overwhelm the Don River. Accomplishing that meant moving the mouth of the river from the Keating Channel to the Toronto Harbour, an immense undertaking with a price tag of more than $600 million — a sum Waterfront Toronto didn’t have. Instead, this time around, landscape architect Michael Van Valkenburgh has taken a novel approach to flood protection, reconfiguring the proposal so flood protection is phased in one area at a time. This also reduces the initial costs. And it means parts of the 400-hectare Port Lands can be sold off for development, with the money used to build flood protection in another area. But she notes, “It doesn’t have to be all done at once,” and the proposal will be phased in over 30 years. Currently, there’s no funding for the project. But David Kusturin, chief operating officer, says Waterfront Toronto’s business plan shows development revenues will cover a significant portion of the costs. Other money may come through loans from the city or province. There’s also a new revenue idea: instituting area-specific development charges to offset infrastructure costs. The agency said it consulted with developers, who have indicated they are willing to help pay for services such as water and sewer. “It makes sense for us to proceed,” Kusturin says. The plan calls for a bus rapid transit line that will eventually be replaced with light rail. The city is currently looking at many ways to increase overall transit funding, including road tolls and gas or sales taxes. An extended transit package expected this fall will include the BRT proposal as well as the East Bayfront streetcar line along Queens Quay, explains deputy city manager John Livey. An environmental assessment of the new proposal could be approved within the next 12 to 18 months, says Fletcher, who will push city council for the $65 million needed to create flood protection in phase one. In that phase, the northwest corner of the Port Lands, south of Lake Shore Blvd. and west of Cherry St., will be developed at a total cost of $447 million, including $267 million in infrastructure costs. The site will be raised slightly higher. Flood protection involves building a spillway along the Don Roadway, east of the area, to absorb excess flow in the event of flooding. The mouth of the Don won’t be relocated until phase three of the bigger project. The Port Lands area is almost as big as the region from Dundas St. to the lake and from Bathurst St. to Parliament St. The soil must be cleaned because it’s contaminated from years of industrial use, and because the area is largely infill, the bedrock lies 10 to 20 metres below the surface, which increases construction costs. The new proposal will go to the executive committee in September and city council a month later. 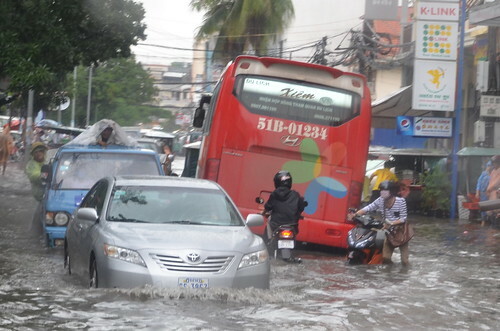 During this year’s rainy season in Phnom Penh, new obstacles facing the city’s drainage system will probably outweigh improvements, experts said this week. Key to that prediction is the recent completion of the scheme to fill Boeung Kak lake with sand, which they say will increase flooding, and the fact that the ongoing drainage project supported by the Japan International Cooperation Agency remains years away from completion. Nora Lindström, advisor at urban NGO Sahmakum Teang Tnaut, which published a 2008 study on the effects of filling in Boeung Kak, said the lake can no longer hold run-off that previously drained there. 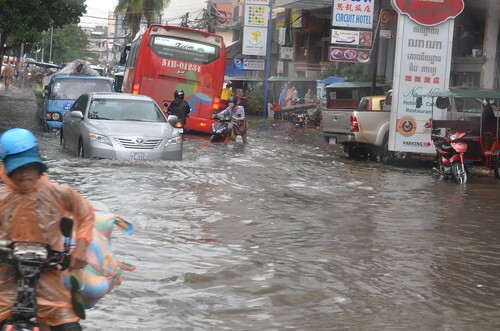 “The Boeung Kak area [where people have been given land titles] has been flooded this year already during heavy rains, as it appears drainage pipes have been blocked by the sand,” Lindström said. She added that supposed mitigating measures taken by the developer, ruling Cambodian People’s Party Senator Senator Lao Meng Khin’s Shukaku Inc, were not “based on sound engineering”, according to the 2008 study. Meanwhile, the new phase of JICA’s Project for Flood Protection and Drainage Improvement in Phnom Penh that begun in March is still in its early stages. “This project is expected to finish at the end of 2015, so unfortunately, the effect of this project will be limited for this year’s flood season,” said Uchida Togo, Environment and Climate Change specialist for JICA’s Cambodia Office. The project’s US$44.2 million new phase will involve several neighbourhoods across the city. Drainage systems installed in previous phases in the city’s northeast and southwest have already helped minimize flood damage, Uchida said. National Committee for Disaster Management’s Pey Sopheap said that regarding the severity of flooding this year, “for the estimation, we cannot say anything”. According to the municipality’s website, Phnom Penh’s district governors met on July 18 to coordinate emergency flood management. The city of Angkor Wat, Cambodia, was a vibrant, growing metropolis in the late 17th century. Angkor was the New York, Paris or Rome of its time. At its peak from the 9th to 17th centuries AD, no one could have imagined any threat to this Khmer city-state. Yet, Angkor collapsed almost totally in the 17th century, and the reasons behind its demise offer an important lesson for today’s cities. Angkor was built on a vast transportation network: canals acted substantially like freeways. The metropolis grew by expanding its network of canals from the central city to form a vast complex of suburban satellites. As depicted below, this was a gigantic enterprise. Ankgor grew exponentially as internal wealth and power increased. The waterways allowed goods and people to move well beyond the central core of the city. City expansion increases with wealth, which leads to suburbanization. Fletcher excavates cities to discover their social, physical, and economic trajectories. He and his colleagues have found a high correlation between extensive low-density suburbanization and subsequent metropolitan collapse. His thesis is that city expansion increases with wealth, which leads to, in essence, suburbanization. Angkor expanded in a mild weather period. 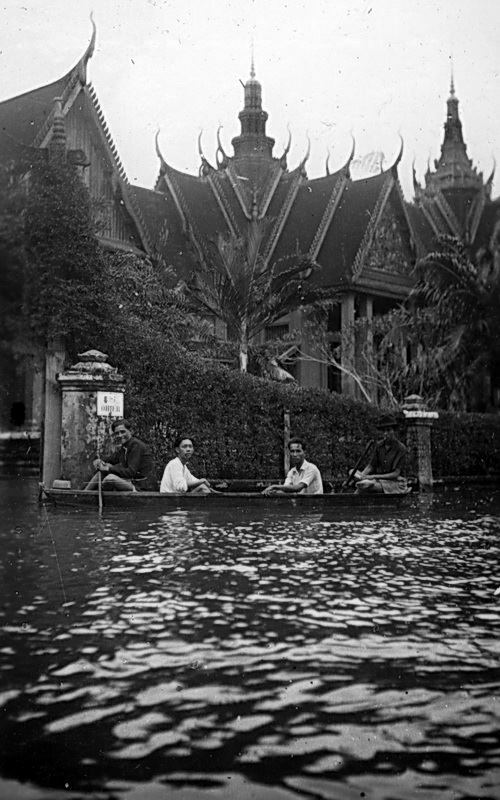 So, Angkor policymakers assumed this weather regime would continue forever and thus built their canals with few water catchments and earthen dams. Today’s sprawling cities expanded in a period of mild weather too, with no anticipation that seas might rise or energy resources could be depleted. Angkor and modern cities resemble one another in that they were built to survive in only the most benign weather regimes. The roads, sewers and the like of the modern suburb are based on an assumption of mild weather and cheap energy. Recent events like Hurricane Katrina in New Orleans and subsequent Midwestern intense storms show how poorly modern infrastructure performs in extreme weather. There may be some debate over the causes and consequences of how cities rise and fall, but there is no doubt we have similar processes at work now in America. New Orleans, Grand Forks, North Dakota, and urban South Central Florida have experienced crippling disasters in the last two decades, where part of the cities have been destroyed beyond our capacity to rebuild them. In 2012, there were more national emergencies for tornadoes, hurricanes, and snow storms that in any other year since records have been kept. As sea levels rise and weather patterns are increasingly unpredictable, basic city settlement systems are failing. Angkor Wat was not the first or last place to go through this evolution of city boom, sprawl and bust. Beirut and other cities around the world have grown and retreated as climatic conditions changed. And of course, we don’t have to look as far back for even more analogues. As our energy supplies dwindle, we’ve watched as radical weather imperils America’s aging infrastructure. It is too simple to suggest that we can draw direct parallels here. But it is useful to learn from the past as we try to build or rebuild for the future. It is also unwise to suggest all suburbs are bad. What policymakers have to confront is what can we do in light of this past evidence. Climate change plays a part but is not the sole culprit. New Orleans, where I spent considerable time post-Katrina as Recovery Czar, is a classic example of city sprawl. The city had almost 15,000 vacant units of housing in its core when the storm hit in 2005. City leaders had expanded the city into surrounding swamplands from 1965 to 1990, doubling the geographic size of the city. So when the storm hit, the city was expanded beyond the bulwarks of levees, leaving the entire city vulnerable to sea surges destroying much of the suburban infrastructure. Cities can generate suburbs; but suburbs cannot save the city. Many American cities have large suburban extensions held together by vast, over-stretched infrastructure. As Fletcher notes, the expansion of low-rise land use patterns require continued expansion of roads, water, and energy resources. This, in turn, could lead to a situation much like New Orleans, where the entire city framework is threatened when climate change alters rain, heat, and sea levels. Beijing experienced this phenomena last month with more than 30 lives lost because the expanded city could not support the volumes of flood water created by expansions of the city into surrounding natural habitat. The lesson for American and similar land use pattern nations like Canada and Australia is to build compact, flexible settlements. One direction already underway is urban consolidation, in cities such as Miami, Indianapolis, and Louisville. Another is containment of sprawl, similar to Portland and Seattle and now Los Angeles. Finally, Denver, Phoenix, and Dallas are trying to re-knit the suburbs with the cities using light rail to generate development along corridors rather than continuous outward development. All of these approaches at this point have merit, but they may not be enough to prevent massive systems failures. So as the nation debates the need for more infrastructure spending, it would be wiser to think of a strategy to improve city cores and reinforce transport spines. Angkor Wat is a useful lesson because it shows that if we don’t take drastic action, we are all facing the grim prospect of massive regional system failures. Cities can generate suburbs; but suburbs cannot save the city.